Learn how enterprise content management complements an EHR to capture a more complete picture of patient care. It’s not news that the last few years have seen huge gains in the number of US hospitals and health care facilities getting into the EHR game. The Robert Wood Johnson Foundation released a report in July stating that the number of hospitals with a “basic” EHR system tripled between 2010 and 2012. That equates to four in 10 hospitals, according to the report. But that doesn’t mean most physicians are happy about jumping on the HIT train—some may liken it to getting hijacked instead. While many physicians see the promise of EHRs, the technology learning curve is proving to be frustrating more times than not. Common physician workflow qualms include less face time with patients, more clerical tasks, and too much template clicking. And, as it turns out, there’s still a whole lot of paper that goes along with “going paperless,” which can further complicate operations. “Research shows that 50% to 75% of clinical and administrative content lives outside of the EMR, including electronic reports from laboratory and radiology departments, digital photographs, and video files of cardiac catheterizations,” says Susan deCathelineau, MS, RHIA, vice president of global health care sales and services for Hyland Software. Improved care delivery, better patient care, greater cost-efficiencies, and help in organizing documents—it turns out ECM, when integrated in the EHR, has the potential to improve a host of workflow and cost concerns. According to deCathelineau, the relationship between an EHR and ECM is complementary, whereby using both solutions together creates “a well-rounded system that efficiently captures and provides access to both unstructured and structured data. 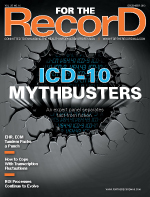 When a health care organization integrates an electronic document management system (EDMS) with its EHR, thus linking all paper documents to the EHR, it’s facilitating a clearer, “more complete health care picture for clinicians by providing electronic access to all of the patient’s health information,” Smith says. Just how can DMS augment an EHR? According to Morris, it can be helpful to see it as a bridge to better usability in an EHR. “A ‘bridge technology’ is needed to connect the intelligence held within an EHR to the intelligence that resides in paper records,” he says. “There are also different areas and systems where patient info resides that need to be connected,” he notes, referring to the wealth of specific and unique patient information that currently resides in disparate insurance company and physician databases. “When that information is combined, a much more complete view of the patient is available to the physician, directly leading to improved patient care and better outcomes,” he adds. Two examples to best illustrate this concept are photographs uploaded for tracking wound care and the processing of hundreds of reimbursement records for easy access by patient name. According to deCathelineau, the greatest indicator of a successful ECM-EHR integration is its invisibility, which ensures a seamless transition. “ECM and EMR companies work together to create and use application programming interfaces that enable seamless integrations,” she says. “Communicating at the database level, the technology is practically invisible as EMR users perform ad-hoc capture, access patient content and cardiac rhythm strips, complete signature deficiencies, or post payments from explanation of benefits forms. According to Wurz, increased efficiencies in productivity and cost are the primary drivers behind every DMS selection. “Efficacy is the expected result of consolidation of various point solutions: a common, shared document repository, elimination of double documentation, and the ability to integrate with clinical and business management systems,” she says. deCathelineau says the care improvements are mainly because of physicians making better decisions when they have access to all available patient information. “With access to the nearly 65% of the patient record stored outside of the EMR, clinicians can make more informed decisions, resulting in improved patient care,” she says. Then there are the cost-efficiencies which, according to Sherling, come from reducing paperwork and freeing physicians to do what they do best: care for patients. “If we look at the economic value of a physician’s time and understand where the bottlenecks are, any system that reduces the burden of paperwork will create cost-efficiencies,” he explains. “Many dermatologists and orthopedic surgeons spend time dictating or typing a consult letter to referring physicians then mailing it out. These same specialists hire staff to scan in outside medical records. EHR systems that can create consult letters on demand with one click and e-fax them back to referring physicians save doctors transcription fees and time to see more patients. “Look for EMR systems that can also receive faxes from the outside world and route them into the EMR without the need for scanning,” he adds. With ECM, clinicians can view these documents remotely as they do in an EHR, saving time and money. For example, after implementing an EMR in 2003, the Mental Health Center of Denver still was frustrated with paper processes. After the facility implemented Digitech’s ECM product, which worked in conjunction with its EHR, it produced a 1,315% return on investment and full project payback in six weeks, according to a study by independent analyst Nucleus Research. “When you take a document and content management system and put it in place as a central repository for a health care facility, I think you’re going to get better efficiency, more control over the information and how it’s stored. And ultimately, the health care facility—whether it’s a hospital or a small practice—can save money,” Morris says. Coming Soon: Two Solutions in One? According to Sherling, the most innovative EHR systems, with well-integrated document management functionality, will not only ease the process of digitizing existing paper records but also structure that data to increase its navigability and value. “Instead of scanning a photograph into the EMR, which is unstructured, take that same photograph from the iPad and link it to the diagnosis within the record and it becomes structured and more valuable to the practice,” he says.